Visiting a city as big as Madrid and managing to see and do all it has to offer is no easy task. From sprawling museums to traditional restaurants and bars, every corner you turn uncovers a spot that draws in tourists and locals alike. There is no shortage of events at Madrid’s Gran Vía, which is known as the city’s very own Broadway. Watch the Lion King, the Cirque du Soleil, Les Miserables, flamenco, a stand-up comedy performance, ballet or great Spanish plays at one of the many venues on and around the Gran Vía. For stand-up comedy, La Chocita del Loro is one of the best venues. Since the Gran Vía is one of the main thoroughfares in Madrid and one of the top attractions, it is not surprising that there are many great restaurants in the area. Visitors can eat strawberry gazpacho, delight in Spanish ham and potato omelet, try the traditional cocido madrileño, watch chefs prepare meals from the bar of a department store restaurant, and much more. The Gran Vía has a lot to offer when it comes to eating. The most obvious thing to do in this commercial street is, of course, go shopping. Most Spanish brands, both high fashion and high-street fashion, are located on this street, as well as some international designers. El Corte Inglés is definitely worth a visit, as it is the quintessential Spanish store. It has existed for decades and houses a great number of renowned labels such as Chanel, Dior and Carolina Herrera. You’ll also find some of its own equally fashionable brands at more affordable prices. Shop till you drop, and then head to one of the many excellent bars in the area to have a drink and recover. The Gran Vía is a very lively street and there are plenty of bars where tourists can go for tapas or for cocktails. Spaniards start leaving their houses and heading for breezy terraces at around 10pm, or even later during the summer, and they party hard, staying out until 6am. Particularly recommended is starting the night at a cool rooftop terrace for gorgeous views over Madrid. 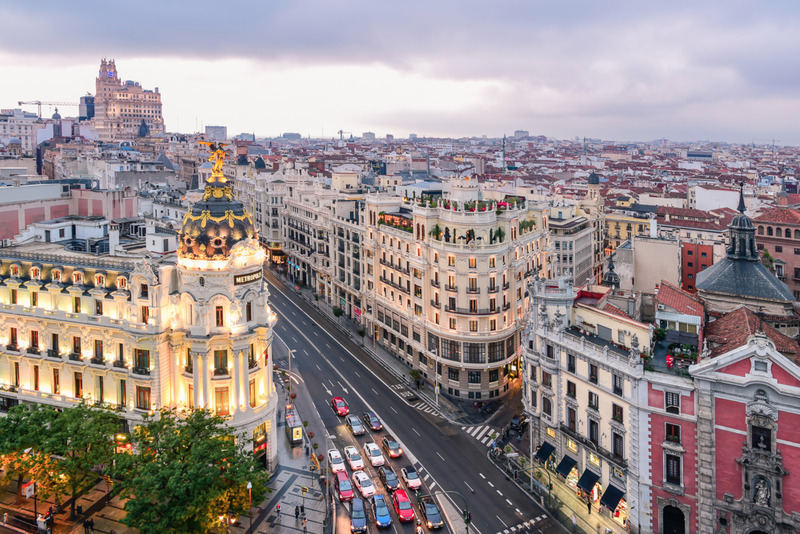 The buildings on this street are truly magnificent; it is no wonder that tourists flock to this part of Madrid to admire the sights and the 20th century style that is so characteristic of this neighborhood. The Metropolis Building is one of the major highlights of this street: it is an office building famous because it has become the symbol of the Gran Vía, with its beautiful facade and the awe-inspiring statue on its cupola. The Telefonica Building is also one of the most famous buildings on this street, and it was inspired by American style architecture, built with some of Manhattan’s skyscrapers in mind. The Monasterio de las Descalzas Reales is open daily for visits, and is one of the top things to see near the Gran Vía. It was founded in 1559 by Juana of Austria, sister to the King of Spain and mother of the King of Portugal, and has ever since been declared part of Spain’s National Heritage. It is a convent located in a former royal palace, and its name literally means ‘Monastery of the Barefoot Royals’. Nowadays there are only a few nuns still living here, so visitors can go inside and visit the museum, which showcases noblewomen’s dowries among other unique objects. At one end of the Gran Vía is Plaza de España, one of the major landmarks in Madrid. It is a decent-sized square in the middle of the historic center, and locals often come here to eat their lunch or play cards on the grass whilst taking in the beautiful weather and the gorgeous surroundings. It joins the Gran Vía with several other important streets, such as Calle Princesa, where more shopping awaits, and Calle de Bailén, which leads to the Royal Palace. These two churches are worth a visit when in the Gran Vía area. The Iglesia de San José was founded in 1745 and built in the Baroque style. Parts of the church were designed by Roberto Michel, the artist behind the creation of the Cibeles fountain. The Parroquia de San Marcos is slightly lesser known, but equally beautiful. The ‘House with the Seven Chimneys,’ this building was built between 1574 and 1577 and was a beautiful, private palace. Although the name points to the seven chimneys as the building’s most remarkable characteristic, what is really fascinating is the mystery that took place behind these walls. Legend tells that Capitán Zapata lived here with his beautiful wife Elena. However, after he died in battle, she was found dead in their bedroom. What is particularly strange about the story is that not only was the cause of death a mystery, but that her body disappeared without a trace soon afterwards, leaving some to say that the house is haunted.